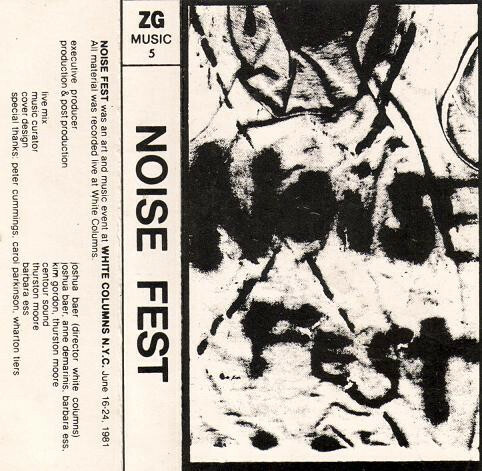 This super-rare (and, if Discogs is accurate, super-expensive) compilation tape recorded live at White Columns gallery in New York City in 1981 and released by ZG Music in 1982. To be sure, not all of these bands are what we today would call "noise", but remember that in 1981 the term wasn't so codified. A lot of this is post-punk, no wave, avant-rock and noisy unclassifiable strangeness, much of which was made by visual artists and/or musicians who played in Glenn Branca's early groundbreaking noise orchestras. The tape includes tracks by Borbetomagus (truly one of the greatest bands this planet has yet produced, here in their classic trio line-up), Y Pants (short-lived no wave band led by former Theoretical Girl Barbara Ess), Blue Humans (in this instance Rudolf Grey is joined by out-jazz legends Arthur Doyle and Beaver Harris), Don King (including members of Mars), the born-to-be-ubiquitous Sonic Youth, Jules Baptiste's Red Decade (featuring Fritz van Orden, who would later form avant-chamber-group The Ordinaires, and Kurt Hoffman who would become a member of late-period They Might Be Giants), UT (who years later would record for the seminal Blast First label), Mofungo (one of many obscure SST Records bands), Khmer Rouge (a tasteless name, yes, but one member of the band, Klaus Castenskliould, would later paint the cover image for The Fall's Perverted By Language LP) plus other more obscure folks: Off Beach, Smoking Section, EQ'd, Jeff Lohn, Avant Squares, Jeff Rehberger, Primatives (note the spelling... this is not the Chrissy Hynde band! 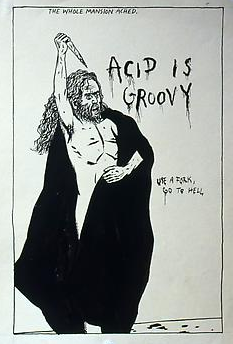 ), Ad Hoc Rock (member David Garland would later play in The Angels of Light and World of Love with Ikue Mori), Economic Animal, Glorious Strangers (led by producer Wharton Tiers), Fakir, Chinese Puzzle, Built on Guilt (featuring painter Robert Longo, who very soon would find popular fame for contributing work to a new television channel called MTV), The Problem, and Lampshades. A time capsule if there ever was one.